2 Children below 8 years are complimentary. Hotel Kanchan Deep combines professionalism and a personal touch with a friendly attitude to meet the expectations of any guest. Although it was established in 1990, this three star hotel has reinvented itself with time to look like a new bride even today. A hotel that caters to clientele from business travelers to luxury seeking vacationers, the hotel is located within walking distance from the bus stop, just 1/2 km from the Railway Station and only 13 kms from Sanganer Airport. 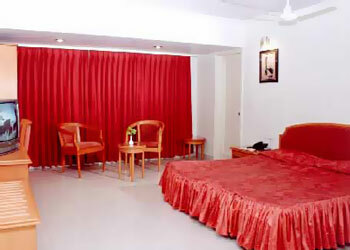 55 well appointed rooms with air-conditioning, colour TV, attached bathrooms, etc.. Each room is furnished with all modern facilities, while the top category rooms also include a refrigerator. Rajasthani Cultural evening at Village.